Michigan Court of Appeals Judge Peter D. O’Connell is among the few who got to the appellate bench the old-fashioned way – campaign and election – instead of the usual route, being appointed to fill a midterm vacancy. He’s a thoughtful jurist. He’s an eloquent writer. And he wants to reduce gamesmanship in litigation by asking everyone, both bar and bench, to look at the bigger picture. The vehicle he’s using to broadcast his message is his concurring opinion in Shawl v. Spence Brothers. (published per curiam) (Wilder and Whitbeck, JJ.). The majority also said that courts should consider the “totally of the circumstances” to determine whether the two necessary ingredients for setting aside a default – good cause and meritorious defense – are in the mix, and included two lists of factors to help judges make those determinations. At the outset, I stress that this opinion is not intended as an analysis or criticism of either the trial court or the majority’s methodology in resolving this case, but as an opportunity to address and reduce the gamesmanship that creates hostile attitudes and friction among litigants, lawyers, and the bench. Some attorneys maintain that gamesmanship is a fundamental and ingrained aspect of the legal process, and that attempts to compete with or outdo their opponents are not only appropriate but also required for zealous advocacy. I contend, however, that this gamesmanship attitude, which is all too prevalent in today’s law practice, is more destructive than helpful, because it brings disrespect upon the law, the litigants, and our shared concept of justice. Although I have no illusions that the game theory of law practice will be eliminated, I remain hopeful that this gamesmanship can be reduced through the application of the totality of the circumstances test to the process of administering justice. Indeed, one purpose of this opinion is to ignite discussion on the topic. Dismissals and defaults are the system’s mechanism for sanctioning those whose conduct does not fall within the confines of the rules. … Litigants who purposefully and repeatedly act outside the scope of, or fail to follow clear and concise, rules deserve special and prompt attention from the court. However, if a timely meritorious claim or defense is alleged and the conflict of the parties reasonably falls within the set of rules at issue, the law favors a lesser sanction than default or dismissal. … But, not all cases are meritorious and not all defenses are worth pursuing, particularly if the costs of litigation exceed the benefits or burdens to the parties. That is why, in my opinion, the best manner in which to balance these issues and reach a fair and just decision is to weigh the totality of the circumstances. Every case is different, with factual nuances that must be identified, evaluated, and balanced to reach a proper result. Only an experienced judge with common sense, wisdom, and a sense of justice is empowered by our constitution to make the correct decision. It is the judge who also exercises patience that generally utilizes the correct process. However, a judge that focuses solely on single process, to the exclusion of all else, sometimes experiences methodological tunnel vision. The process then becomes perfunctory and often results in unjust, illogical, and incongruous outcomes. O’Connell’s words are a thoughtful reminder that lawyers behaving as warriors and rulings from the bench that exalt form over substance sometimes thwart the court system’s primary mission – dispensing justice. It’s something to think about over the long Labor Day weekend. Convention floor fight brewing for MDP supreme court nomination? Wayne Circuit Court Judge Diane Marie Hathaway told the Associated Press yesterday that she’s “strongly” considering a run for the Michigan Supreme Court and will announce her decision before the Michigan Democratic Party convention, which opens Sept. 5. If she decides to seek the Democratic nomination, she could have a convention floor fight on her hands. Fellow Wayne County Circuit Court Judge Deborah Thomas, who’s been campaigning for the nomination for quite some time, says she won’t back down. According to a report in Michigan Information and Research’s Capitol Capsule, Thomas said that state Democratic leadership would be making a mistake by nominating Hathaway, who has received organized labor’s endorsement. Thomas actually defeated incumbent Justice Stephen Markman in Wayne and Washtenaw counties in 2004 and wiped out the other Republican-nominated candidate, Appellate Judge Brian Zahra, by a 3-to-1 ratio in Wayne County. In 2006, when Hathaway tried to unseat Zahra, who was running as an incumbent, she lost to Zahra in Wayne County. MIRS reported that Thomas’ campaign manager, Gigi Thomas, is mobilizing supporters and getting them ready for a floor vote. 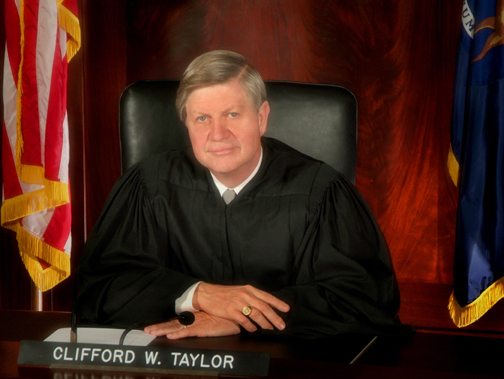 Meanwhile, Michigan Supreme Court Chief Justice Clifford Taylor breezed to the state Republican Party nomination at the party convention in Novi over the weekend. Medical malpractice, discovery, Big Tobacco and law firm marketing highlight the Aug. 25 issue of Michigan Lawyers Weekly. Subscribers can click any of the links below for the full details. For the rest of you, click here. – Dianne Byrum, frontwoman for Reform Michigan Government Now!, quoted in The Detroit News. Well, how else would you expect her to respond to the Michigan Court of Appeals decision that halted the RMGN’s ballot proposal dead in its tracks? The RMGN folks promise endless appeals, starting today with the Michigan Supreme Court. – Robert LaBrant, Michigan Chamber of Commerce vice president and chief architect of the opposition to RMGN’s proposal, quoted in The Detroit Free Press. The Michigan Court of Appeals ruled there is a great difference between amending the Michigan Constitution, which can be accomplished at the polls, and wholesale revisions, which require convening a constitutional convention. The COA said the RMGN proposal was most definitely a revision. The proposal would alter four articles of the Michigan Constitution by modifying 24 existing sections and adding four new ones. According to the common wisdom, Brewer had a big hand in drafting the proposal. – Danielle Hall, career and professional development coordinator for Cooley Law School, quoted in The Oakland Press. Hall was reacting to the statewide statistic that 27 percent of the sitting judges are women. In Oakland County, the percentage could jump to more than 50 percent on the circuit court bench, depending on the outcome of two judicial contests in November. Nine of 19 circuit judges are women. Two male judges are retiring. In the August primary, the two female candidates looking to fill the openings outpolled their nearest competitors by a 2-1 margin. – Nate Craft, former hit man, quoted in The Detroit News. More than 20 years ago, Craft bargained down a first-degree murder charge and life sentence in exchange for his testimony against his former employer, the Best Friends drug gang. He was released from federal prison this spring but was denied participation in the witness protection program. Worst yet, says Craft, the terms of his probation require him to live in Michigan for the next two years. He spends his days peering out his windows and looking over his shoulder. 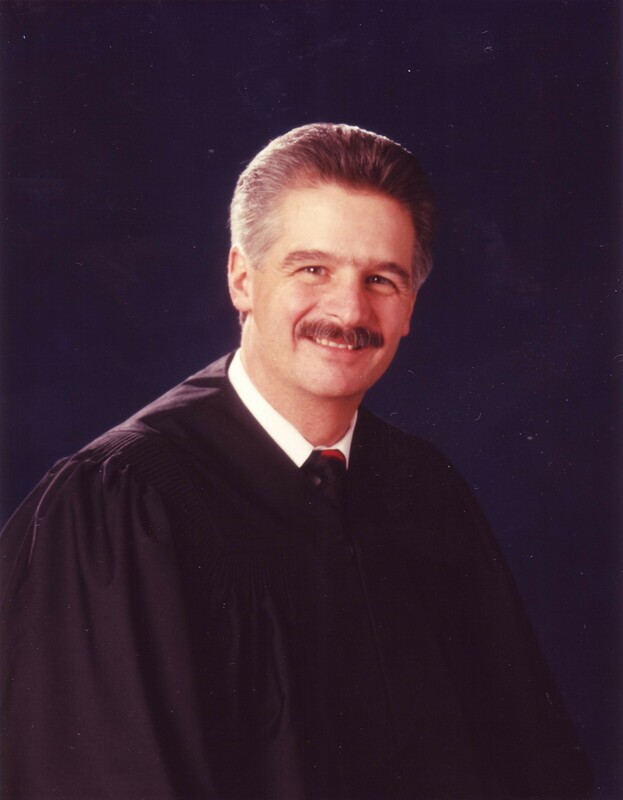 It’s good to be an MSC chief justice seeking re-election . . .
. . . just ask Cliff Taylor. Or better yet, check out his campaign finance filings. Michigan Supreme Court Chief Justice Clifford Taylor: campaign contributions are rolling in. The Michigan Republic Party takes the lead on a list of Taylor’s top contributors, followed by everyone else you’d expect: the Prince/Devos family, groups representing business concerns, restaurant operators, realtors, insurers, banks, the medical profession, and Dykema Gossett. Meanwhile, the Michigan Democratic Party, staring hard at the Sept. 5 kickoff date for their state party convention, is still scrambling for a top court candidate to nominate and shower with money. The party’s unfruitful search for someone to square off with Taylor has been well-reported, and has prompted Susan J. Demas, blogging in Capitol Chronicles, to suggest that the “obvious choice” has been in front of the Democrats all along. Check out her tongue-in-cheek suggestion that MDP Chair Mark Brewer should go for it. It’s been three years since the Michigan Supreme Court, in Glass v. Goeckel, famously clarified the public’s right to walk along Great Lakes shorelines and left murky just where the walking can take place. Where is the ordinary high water mark? Is it the debris washed up in the foreground? What about the bluff and tree line in the distance? But despite the confusion about where you can walk, you have to keep moving. Beach walking is protected, not beach gawking. 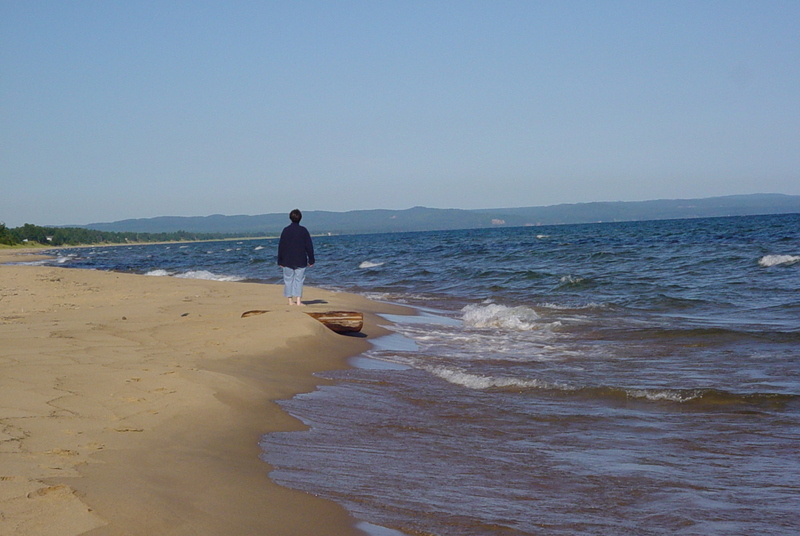 This beach walker on Lake Superior just east of Marquette is probably in the right spot. In Leelanau County, where beach walking is a secondary form of recreation, the first being tasting the latest vintages from the area’s many outstanding wineries, Leland Township officials are dealing with two issues. First, a lot of roads end at Lake Michigan. In Leland Township, a public right-of-way extends from the road end to the water’s edge. People hang out there in the sand. 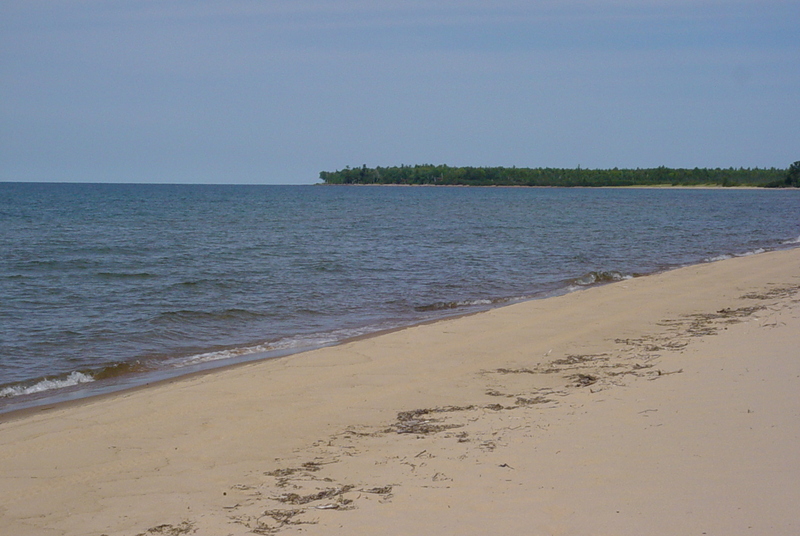 These public beaches are frequently hemmed in by privately owned land. Second, there’s all that Lake Michigan shoreline available to walkers under Glass, and readily accessible from the public right-of way. The inevitable conflicts have developed. The solution is new signs, say Township Supervisor Harry Larkin and Clerk Jane Keen. “Our old signs said it was illegal to walk along the shoreline outside of the public right-of-way,” Keen told The Leelanau Enterprise. Glass took care of that and the old signs belatedly came down last summer. “The problem with the ruling, at least in the eyes of Keen and Larkin, is the high water mark is not easily determined or marked on each private beach. But that’s not a bad argument under the Glass Court’s definition. So, here’s Leland Township’s new approach. The signs won’t have any guidance about beach walking. It’s going to take an overreaching beach walker, a crabby property owner, a befuddled sheriff called to issue a trespassing ticket and another climb up the appellate ladder to flesh things out.